Tone is in our fingers, our hands, our arms, our back, our skin, our nerves, our emotions and our mind; but we are here to think about effects pedals (be they distortion, fuzz, delay, or those that defy classification) and how they relate to tone. I understand tone as something much more than just a sound. Tone is something experiential, creative and surprising. For me, tone is that moment when you are playing and inspiration hits you like a lightening bolt. A new idea emerges out of silence, it is almost like the insight that arrives through meditation. Tone is the very vehicle for creativity. Tone is feeling made manifest through sound. That rare chance when you are playing in the moment, your playing, the guitar playing you, your body and the response from the audience; this totality of experience can only be described as embodied sound. Embodied sound is the nirvana of noise, a place to strive towards, a place where creativity is born. Vibrating air waves flow though our bodies and are generated by ourselves. I believe effects pedals are an intrinsic part of how we manifest tone. They enable and disable, they create and destroy, they transcend and return, they give life to tone and we live within sound. At Pierrot Pedals, we love to make sound; we like to philosophise about sound, its experiational manifestations and how we perceive it. All our pedals aim to present opportunities for people to expand what is possible with sound, for the pedals to become points of departure for creativity and new discoveries. “Sounds are really just interesting things to be doing with the air”, Tom Waits. 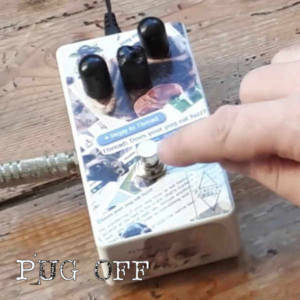 Will Pollard is the founder of Pierrot Pedals and all round nice guy. Does Your Pug Eat Fuzz and Quetiapine are available now from Break the Machine.